The world’s most well-known store of denim outfits, Levi’s, is currently offering a great gift with purchase. Buying a pair of jeans you also get a tool kit which allows you to repair your clothes or customize them. Why advertise using tool kits? The challenge of this marketing campaign is to position Levi’s as a friendly, innovative and creative brand. The promotional gift that they are offering is a tool kit, to repair and customize your clothes. From a marketing point of view it perfectly shows that the company meets the needs of the customer. The slogan of this promo campaign is “We make denim. You make it your own”. It perfectly explains the idea of the campaign. 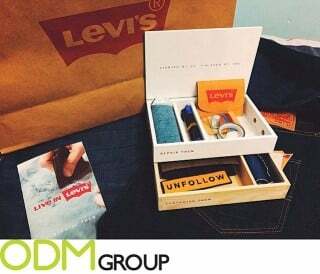 Levi’s came up with a great idea to offer promotional items which complement their main goods. No need to worry any more if you ripped your jeans or you want to be more creative and express yourself. You can have everything that you need for it, all with this gift with purchase. The tool kit comes in a solid box which has two sections. A set of such items as threads, needles, and extra fabric allows repairing your favourite jeans and shirts. Patches, markers and some rivets will help you to be creative, keep your own style and customize your clothes. You can also check tutorials from Levi’s at their web-site. At ODM we think that this is a brilliant idea of a gift with purchase. The box as a promotional product can be easily customized by printing the logo or slogan on the surface. By keeping this printing simple and only having the logo as well as the drawer labels, the box itself creates curiosity as to what’s inside. The tool kit as a promo gift adds a great perceived value to the purchase. Customers will be pleased to receive a gift and it will give them a feeling that they have got much more that they have paid for. Offering a gift with purchase you can attract more customers and boost your sales.